Vaseux Lake Bird Observatory is located on the west side of Highway 97, 1 km north of Vaseux Lake and 4 kms south of Okanagan Falls, BC. It is a member of the Canadian Migration Monitoring Network. 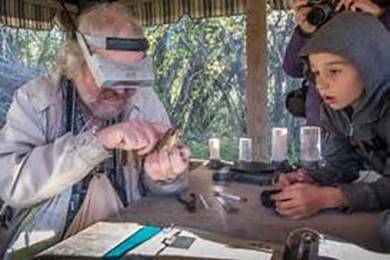 Vaseux Lake Bird Observatory banding station is open August 1 to October 15 from dawn until noon each day. The public is welcome to visit. Located off Hwy 97, 4 km south of Okanagan Falls (watch for parked cars). It is located on land owned by Environment Canada (Vaseux Bighorn National Wildlife Area) and by BC Ministry of Environment. Species commonly sampled are Orange-crowned Warbler, Gray Catbird, Song Sparrow, Willow Flycatcher, “Audubon’s” Warbler, and Common Yellowthroat. The station operates every morning from August 1 through October 15. Migrants are sampled through banding (with 14 mist nets), a daily census, and general observations. For more information and weekly updates when the station is open, visit the Vaseux Lake Bird Observatory blog.